Help Geology purchase new petrographic microscopes for Mineralogy courses! We currently use the same microscopes in our upper division classes, and they are wonderful. But remember those old monocular microscopes for Mineralogy? They are falling apart and need to be replaced! This campaign presents an opportunity to contribute directly to the teaching mission of the Geology department at Western Washington University. The department has grown to nearly 200 majors and 40-50 mineralogy students will use these microscopes each year. 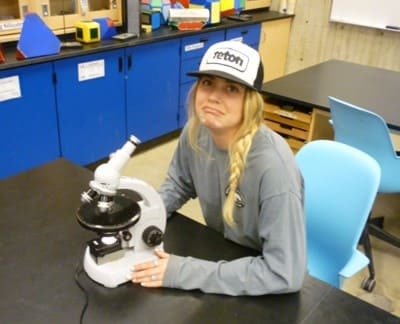 Western Geology students will continue to learn the foundational principles of petrology and petrography, but now while using modern, high-quality equipment. We have a one-time chance to capitalize on a significant discount from Leica to purchase these microscopes. Please help us replace our microscopes and continue to inspire generations of new geologists. Some green rocks, and some green money! This is a high-grade donation! We would be honored to put your name on a plaque in the mineralogy room, highlighting your contribution to the WWU Geology program! This is kind the of change you can only see in places like WWU! Very important, very impressive. We would be honored to put your name on a plaque in the mineralogy room, highlighting your contribution to the WWU Geology program! This is our highest grade of giving, the equivalent of purchasing a complete microscope! We would be honored to put your name on a plaque in the mineralogy room, highlighting your contribution to the WWU Geology program! If you would like, we can also put your name on a plaque mounted on the microscope you purchased.